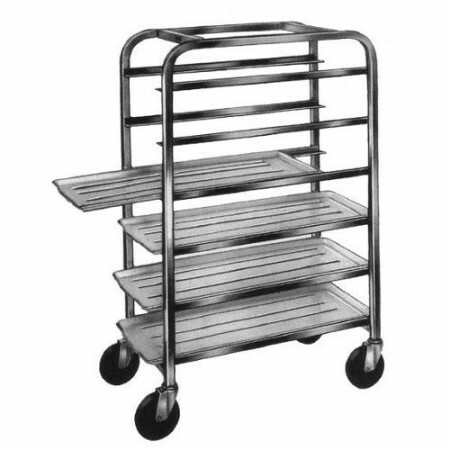 The Win-Holt AL-186 6-Tray End Load Aluminum Platter Cart is an economical and practical addition to butcher shops, meat departments and other food processing establishments. Designed to roll easily on polyethylene swivel stem casters, this cart is perfect for transporting meat and produce from the meat room to the sales floor. Thanks to its rustproof all welded aluminum construction, this platter cart will withstand the rigors of heavy duty use. For added convenience, this end-load platter cart can hold (6) 18" trays and has enough space in-between to maximize storage.